The goals of laparoscopic radical prostatectomy, as in retropubic radical prostatectomy, are lifelong oncologic control of localized prostate carcinoma while minimizing operative morbidity, maintaining continence, and preserving potency. 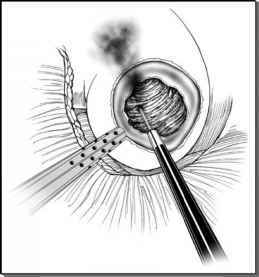 Laparoscopic radical prostatectomy has become a worldwide accepted alternative to open surgery. The indications for radical laparoscopic prostatectomy are the same as that for the open procedure including treatment of men with localized prostate carcinoma and life expectancy of 10 years or more. Compared to open surgery, the most relevant advantages of laparoscopic radical prostatectomy are decreased morbidity and shorter convalescence. The authors could not detect a significant difference when comparing the rate of positive margins after open or laparoscopic radical prostatectomy, either for pT2 or for pT3 stage tumors. Wide resection of the bladder neck and cutting the puboprostatic ligaments decreased bladder neck and apical positive margins (47). Nerve preservation does not increase the incidence of positive margins. Oncologic outcome after laparoscopic radical prostatectomy will not differ from open surgery. No specific oncologic risk such as port site metastases correlates to the laparoscopic technique. There are no significant differences between the laparoscopic and open approach either with respect to overall 12 months continence or regarding the three months continence. There are no significant differences between the laparoscopic and open approach as regards recovery of potency. Early outcomes have indicated that once the learning curve is established, transperitoneal laparoscopic radical prostatectomy is at least equivalent to open radical prostatectomy in terms of operation times, early oncologic outcomes, and continence and potency rates.